Portable hardness tests are performed by using various types of methods such as portable Brinell hardness tester, Leeb hardness tester, Poldi hardness tester, impact telebrineller hardness tester, ultrasonic hardness tester and several other proprietary hardness testers such as Asaki and Krautkramer. Details on various hardness tests are stated in sub-sections of this webpage. By definition, a hardness is a material’s property to indicate its resistance to indentation. A hardness value is scaled by measuring the permanent depth of the indentation formed by gradual application of force on the indenter and mathematically represented at a numerical scale. Except portable brinell hardness tester, all of the above hardness test methods are not true hardness test methods. At LMATS, the highly experienced team of Metallurgist and materials engineers recommend Krautkramer TIV Optical hardness tester as a portable and relatively non-destructive testing method. Unlike some of the other readily available portable testers (referred as hardness) testers, Krautkramer TIV Optical hardness tester is almost a true hardness tester by definition of a hardness test. Krautkramer TIV Optical hardness tester applies the principles stated in AS 1817.1, ASTM E92 and ISO 6507-1. 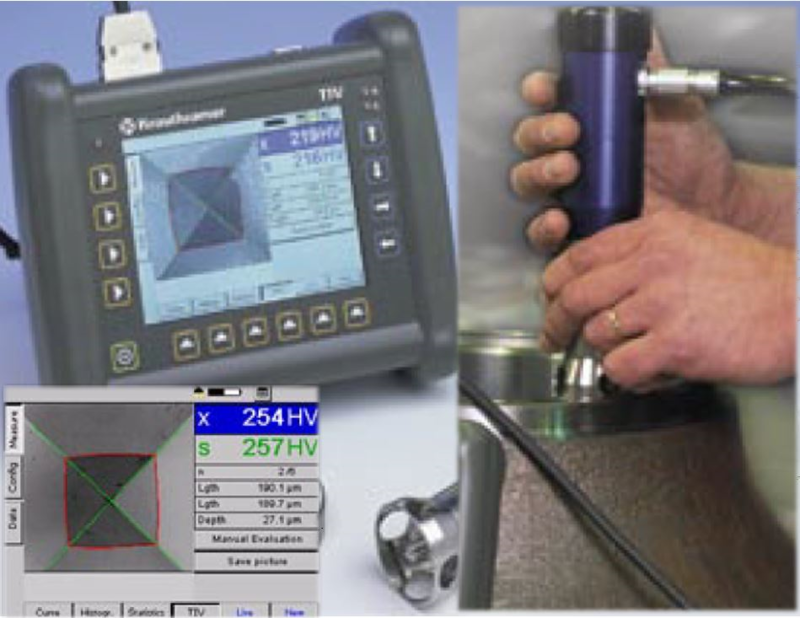 Krautkramer TIV Optical hardness tester applies a test load of 5kgf (50N) using a hand-held assembly (referred as a Probe TIV105) containing a standard Vickers hardness test diamond indenter. Depth of the indentation (by way of measuring diagonal lengths) is measured through the transparent diamond indenter by the CCD camera coupled within the Probe. The formed indentation can also be measured manually. The instrument is battery operated, portable and can be used anywhere; in the laboratory environment or in the field on in-situ components. Similar to any other standard hardness test, high level of surface preparation is essential to obtain accurate, repeatable and reproduceable results. LMATS offers Portable hardness testing from our Perth, Melbourne, Sydney, Newcastle, Brisbane and Albury laboratories. LMATS regularly performs portable hardness testing in VIC -Victoria, NSW - New South Wales, QLD - Queensland, WA - Western Australia, SA - South Australia, TAS - Tasmania, NT -Northern Territory and some of the neighbouring countries at request. To find out more about LMATS portable hardness testing, simply contact one of our laboratories nearest to your location.